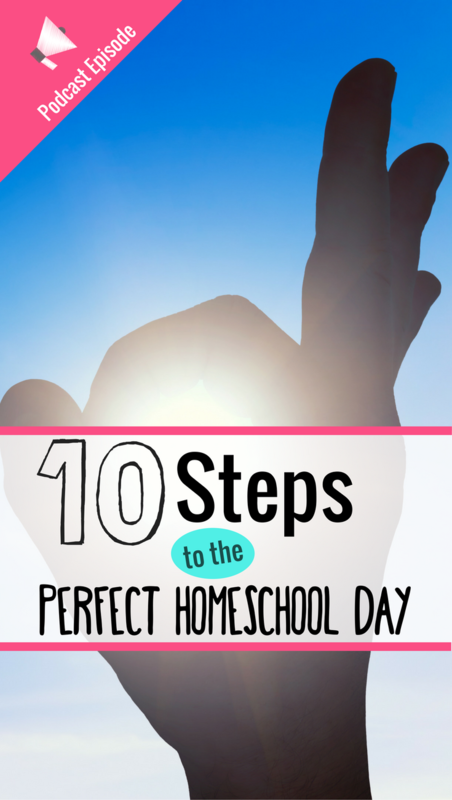 You are here: Home / Podcast Episodes / S2E6: 10 Steps to the PERFECT Homeschool Day! Homeschooling is never EVER perfect. It is chaotic, messy, fun, frustrating, overwhelming, exciting and outright adventurous every. single. day. There are no two days that are exactly alike and there is no magic formula. There is no perfect curriculum, no perfect routine, no perfect approach. Sometimes we try SO hard to get it all right, you guys. We try so hard to make sure we are doing everything in our power to create a positive learning experience for our kids. And I know we do it out of love, but sometimes instead of making our homeschool awesome, it wrecks our homeschool with pressure and stress. So today, we’re just going to laugh at the expectations we put on ourselves. I took some of the most common “tips” to a successful homeschool and grossly exaggerated them in this fun satire. And in case you were wondering, I used every ounce of sarcasm and had an absolute HOOT recording this! The last five minutes I chime in a bit about how ridiculous my suggestions were and how very different my days look. It is my hope that if nothing else it makes you laugh, encourages you that you are doing just fine, and reminds you to take off a bit of that pressure you’ve been carrying around! You’ve got this! A few notes that I forgot to mention in the episode… when I talk about not envying our friends for sending their kids to school, I make it sound like homeschooling is the superior choice. Obviously I believe it is the best choice for our family or I wouldn’t be doing it. But I know that it doesn’t always work logistically, emotionally, or even physically for a lot of families. Again, this is a satire, not my actual opinions on said topics that are brought up. The goal is to make your laugh, not cause a riot 😉 Happy listening! What kind of expectations do you or others put on what homeschooling should look like? Chime in! Awesome episode! My 8 year old was listening (while doing math) and did not get the sarcasm and said “she must be a professional homeschooler huh mom”. ? HA! That is awesome! Love it! Rebecca, This was too funny! First of all, 4am? The only way I am seeing 4am is if I take my evening prep-time into the wee hours of the morning. I too am one to hit the snooze button, and require multiple alarms to go off. Truly. My morning tea… I am lucky if I can finish half before it get’s cold. We do try to start school by 9am, because we have extracurriculars daily at 2, but I don’t care if it’s in jammies or not. As long as they are dressed when we leave the house (or if I need a picture for something). Mandatory subjects… ummm yeah. We focus on math and science daily, history most days, and LA as often as we can. We do try to combine LA with our other subjects when possible (thank you BW!). What I really try to focus on is a love of learning, being kind, and being helpful. You know, the basics? I figure they have their whole lives to learn, but if they don’t enjoy learning the will never move past what they are taught. Kindness and compassion will always be more important in my book than any history lesson or math concept. Oh, and for PE, try “Duck, Duck, Goose” on the trampoline! It’s super fun and anyone can do it. Our only rule is you have to jump rather than run. Thanks for “posting” this! It was amazing! Truly. And a few years ago, exactly what I was trying to live up to. Daily planning, which drove me crazy, ruled my life and ruined my hope that homeschooling could work for us. Today, while we are not at Charlotte Mason as you are, we are a more lazed homeschool. We are finding a better grove between what we think they need and what they truly need, a more relaxed homeschool that allows for life. Real life. Which as well all know is always busy, and chaotic, and cannot be planned down to the minute. I definitely need to add the hourly cup of coffee to my day, ha ha. This was great Rebecca. I loved it.